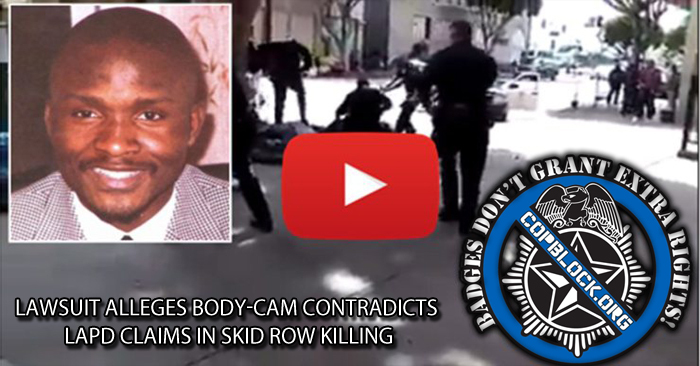 A civil lawsuit filed in Los Angeles Superior Court Wednesday claims that police body-cam footage contradicts LAPD officer accounts regarding the March 1 shooting death of an unarmed homeless man on skid row. Police had said that 43-year-old Charly Keunang attempted to grab an officers holstered firearm during a struggle after cops were called to the scene by another homeless man. The Keunang family maintains in the lawsuit however, that the body-cam footage does not back up that claim. The footage from two police body-cameras have not been made public but the LA Times says sources told them the videos captured an officer shouting, “He’s got my gun” before police opened fire. An enhanced version of a bystander’s video, the Times also claims, shows Keunang reaching toward an officer’s waistband as police brutalize him on the ground, but it is hard to tell from the original resolution footage. That footage, which went viral after the incident, outraged the nation and ignited protests in the city. Keunang, a Cameroonian national, had previously served 14-years in a prison mental hospital. The lawsuit claims police were told he was mentally ill before the confrontation. The mans death revived the debate about how police are trained to deal with with mentally ill and drug-addicted people like the ones found on skid row. According to an investigation by the Washington Post, 27 percent of the people killed by police in the first half of 2015 – 124 out of 462 people – were mentally ill or in emotional distress. More than half of the killings involved police agencies that do not provide officers with proper training on how to deal with mentally ill suspects, the Post said, resulting in officers responding with tactics that quickly escalated the situation. The lawsuit clams witnesses corroborate that Keunang did not reach for a gun and tried to “calmly engage in discussion with officers,” before crawling into his tent. “At that juncture, the officers exploded into acts of violence, almost certain to cause anyone, much less a person suspected of suffering from mental illness, to panic,” the suit says, and contends that police – who vastly outnumbered Keunang – could have used less than lethal tactics to resolve the situation. An autopsy said Keunang suffered six gunshot wounds in all, with two “contact gunshot wounds,” fired directly against his body. The amount the Keunang family is seeking has not yet been specified, but an earlier claim against the city was asking for $20 million. According to the Police Executive Research Forum, police only receive an average of eight hours of training to de-escalate tense situations and spend only eight hours learning strategies for handling the mentally ill. Mental health experts assert that they need to at least quadruple this training, and say officers should be required to spend as much time learning crisis-intervention tactics as they currently spend learning to use their weapon – which is around 60 hours.